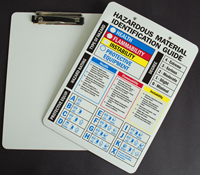 While handling hazardous materials, practicing caution is of utmost importance. A small slip in safety can lead to a loss of life or property, or both. 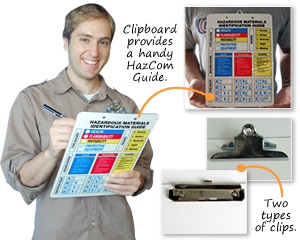 Order our HMIG Clipboards for your employees who work daily with hazardous materials. 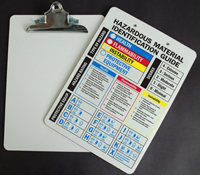 The clipboard features a hazardous materials identification guide that can be used as a quick reference while performing hazardous tasks. • HMIG clipboard helps in assessing the type of hazard, its intensity, and the correct PPE to wear while handling a hazardous material. 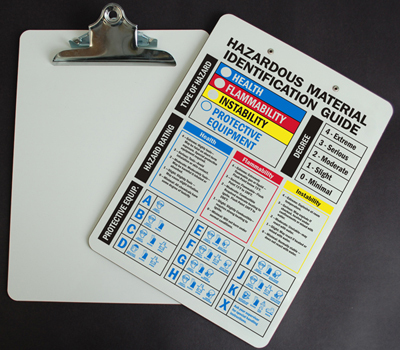 • The clipboard comes in handy during safety inspection, making it easy to check whether materials are being handled per OSHA specifications. • Print is dye-sublimated on the back of the clipboard. Choose from a metal spring clip or low-profile clip.